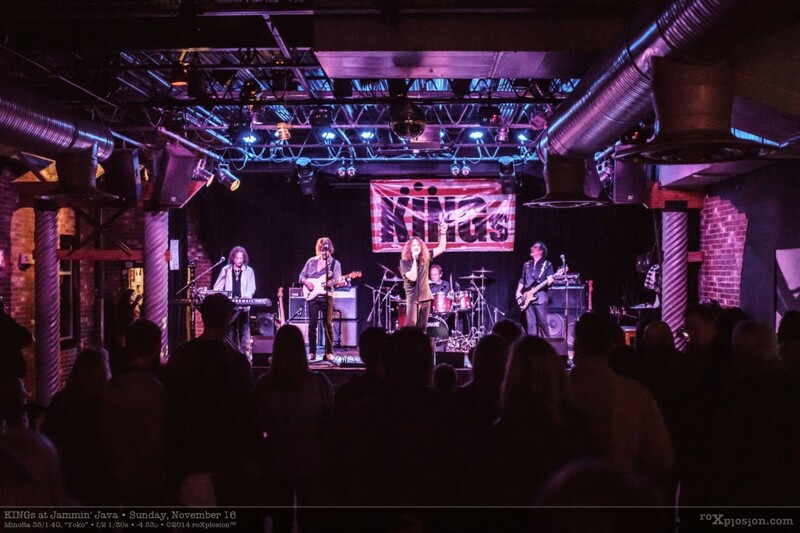 KINGs are a new East Coast melodic, yet heavy-hitting rock band featuring three former members of King Friday: Joe Macre: Bass, Vinnie DePaul: Keyboards and Phil Naro: Vocals. The newly revamped line-up adds drummer Corey Holland and guitarist Michael Fath. Phil is the Daytime Entertainment Emmy Award winning vocalist for the theme song of the cartoon “6Teen”, as well as an internationally acclaimed composer, singer, guitarist and producer. Naro’s career began in his hometown of Rochester, New York, at the age of fifteen, where he performed in a variety of popular high school bands. Word of his amazingly powerful voice and tremendous four octave range quickly spread to the local bar bands, where he pursued his musical career. Phil is best known as the former front-man of 80’s rock band Talas. Phil further developed his writing talent, recording songs with other musicians in Rochester and Buffalo area. Phil recorded with dozens of popular band around the world as well as releasing several solo albums. When he is not recording or performing with KINGs, Naro records, produces or appears with his other projects like; Rochester based DDrive, Canadian Progressive Rock band Druckfarben and Venezuelan Progressive Rock band Backhand. Phil will also be featured on the upcoming releases by Corvus Stone as well as Larry Gowen of Styx! Joe is not just a world-class bassist, producer and engineer, but the founder of Cuppajoemusic, which produces various artists, and composes custom scores and sound design for film and TV. Joe’s music career began in high school and proved to be the start of a phenomenal road to success. He recorded five albums and toured with renowned rock group Crack The Sky from 1975–1980. Joe has also worked with The B. E. Taylor Group and Wild Cherry. About Corey Holland: Corey is a nationally acclaimed drummer, engineer and producer, including sessions and touring with Joe Lynn Turner, Pat Travers, Michael Fath and Switched at Birth. Corey has numerous song writing, production and engineering credits. About Michael Fath: Michael is an electric and acoustic guitarist (as well as banjo and mandolin) composer, producer and vocalist. He established himself as a truly international phenomenon with a staggering range of instrumental recordings that have featured unparalleled versatility with both acoustic and electric guitars. Michael has mesmerized audiences and critics alike have taken note of the seemingly impossible manner with which one artist can freely blend classical, roots, and jazz idioms, and still be so vastly encompassing in his mastery of an instrument. In his junior high school years, Michael’s evolving musical genius led him to quickly become an outstanding classical trumpet player, later in high school he also participated in piano studies. Michael started his path to guitar mastery also at an early age, and played in various rock groups throughout high school and college. At age 21, Michael began his jazz guitar studies with Bill Biesecker. He later began his formal classical guitar training with the renowned Jeffrey Meyrriecks, continuing for a five-year period; during this same time frame also beginning studying flamenco guitar in depth with Carlos Ramos (Paco De Lucia’s first teacher), and later with the internationally renowned grand master Paco De Malaga. Michael has released 25 solo albums, and was “Instrumentalist of the Year” by Guitar Magazine, and has produced several rock, pop and jazz records.